Not a lot of change here as fishing continues to improve here. Fishing was good last Saturday during the snowy/rainy weather and several anglers report good days of fishing here. However, heavy flows continue to come into the lake bringing lots of dirt and debris causing the water to be very turbid, especially at the south end. PowerBait seems to be working better than worms. Anglers are also having success using wooly and seal buggers. Other small flies such as hares ears, egg patterns, soft hackles, egg sucking leeches and chironomids should work from shore. Chironimids such as snow cones, frostbite chironomids, zebra midges and Yankee buzzers in rootbeer, black and red seem to be working. Especially if fished right off the bottom in about six to eight feet of water with muddy bottom. 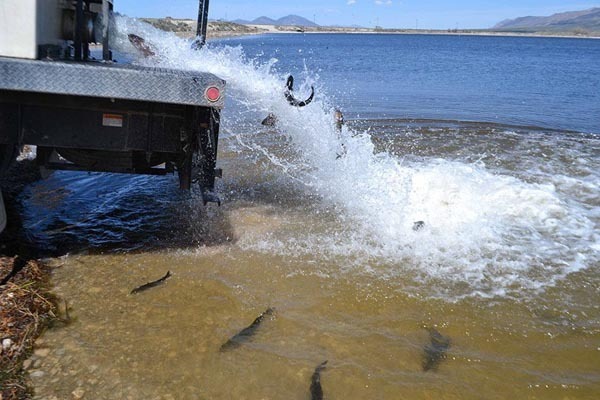 Trout are cruising the shallows where the sun can warm up the water to a more desirable temperature. Smallmouth bass are being caught using crawfish patterned flies and lures. Wipers are starting to show up in the creel with fly rodders catching a number of wipers in the middle of the week using black woolly buggers. Good places to fish include the north end of Jet Ski Beach, the last cove before the dam on the northeast side, the main boat ramp cove and from a boat or float tube at the south end of the lake.